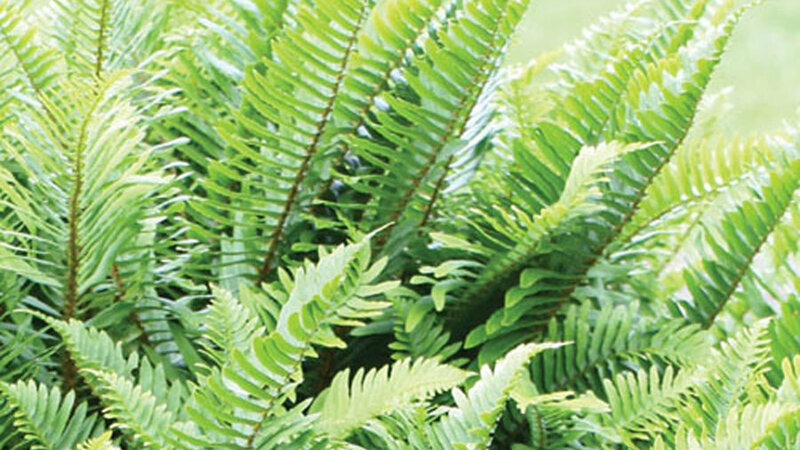 Plant these delicate, medium-sized ferns in mixed borders to show off their feathery fronds. Autumn ferns (D. erythrosora) are one of the few ferns with seasonal color variation and their fronds change from pale gold and pink in spring to green in summer and rusty copper in fall. The ferns spread by underground stems to form swaths in garden beds. 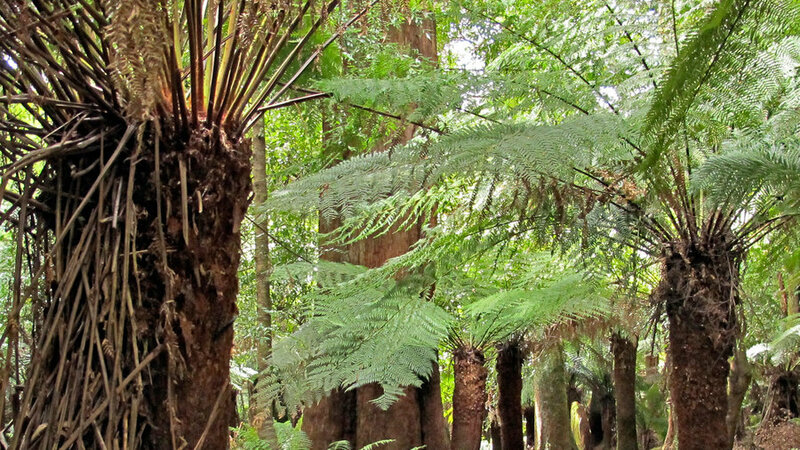 Wood ferns of all types grow best in rich soil with consistent moisture but can tolerate dry shade. The broad, bright green fronds of Australian tree fern (C. cooperi) grow from the trunk crown to form a ferny canopy in the forest understory. 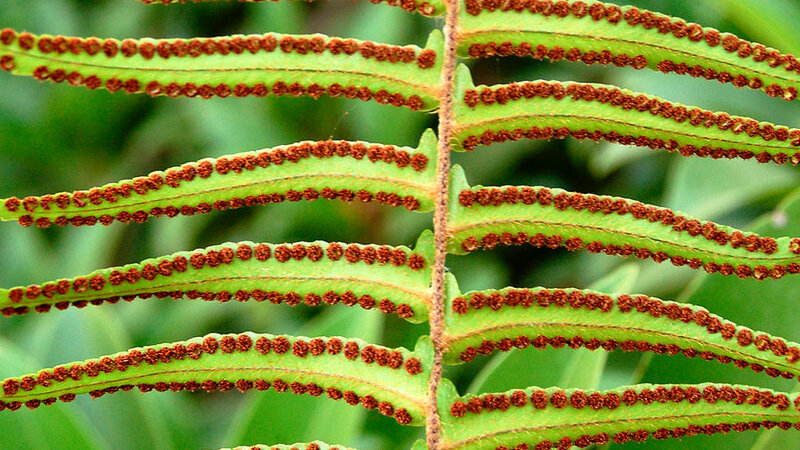 Native to Australian subtropical forests, the ferns are becoming an invasive pest in Hawaiian rainforests where they grow vigorously to 20 feet tall and 12 feet wide. In gardens, plant them in beds rich in organic material and mulch around trunk base to keep soil moist. Plants are cold hardy to 20° F. Also sold as Alsophila australis, A. cooperi, and Sphaeropteris cooperi. See also: Tasmanian tree fern. 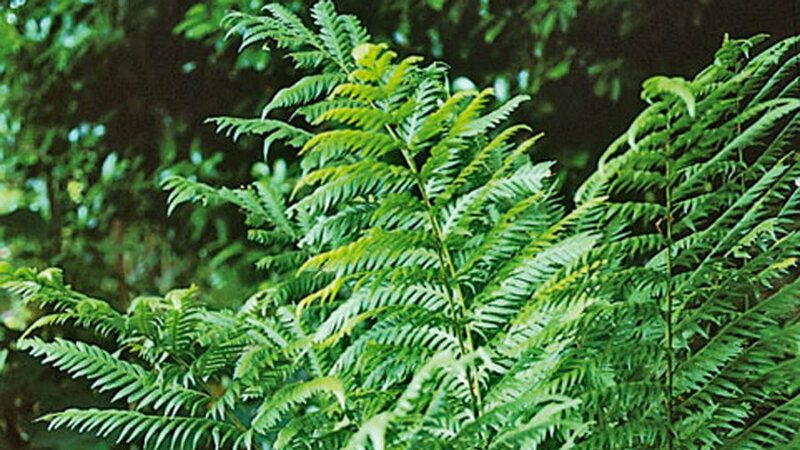 Grow these medium-to-large woodland ferns in moist soil amended with plenty of organic material. Giant chain fern (W. fimbriata) are some of the largest native Western ferns and can reach as tall as 9 feet in the wild, typically 4 to 5 feet tall in gardens. 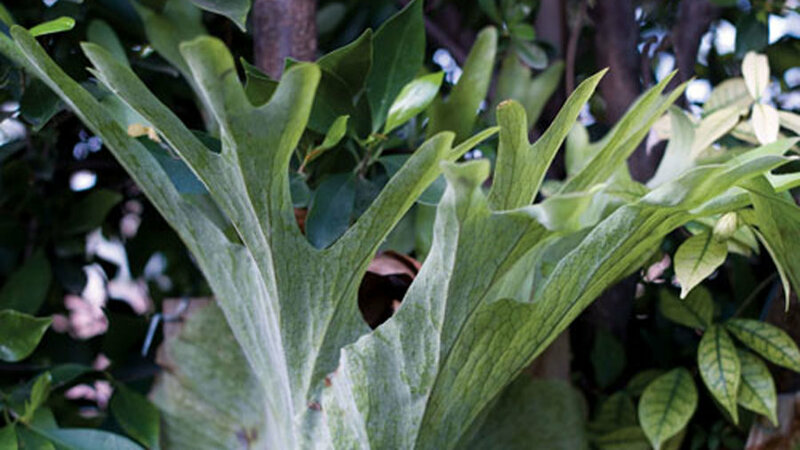 Plant as a focal point in a garden or mass along a bank to appreciate the arching fronds. The dramatic fronds of these Hawaiian natives (also called Hapu’u or Pulu) grow between 3 and 9 feet long and have fuzzy brown wool covering the base of leaves and tip of the trunk. Over time, trees will grow up to 20 feet tall and 15 feet wide. 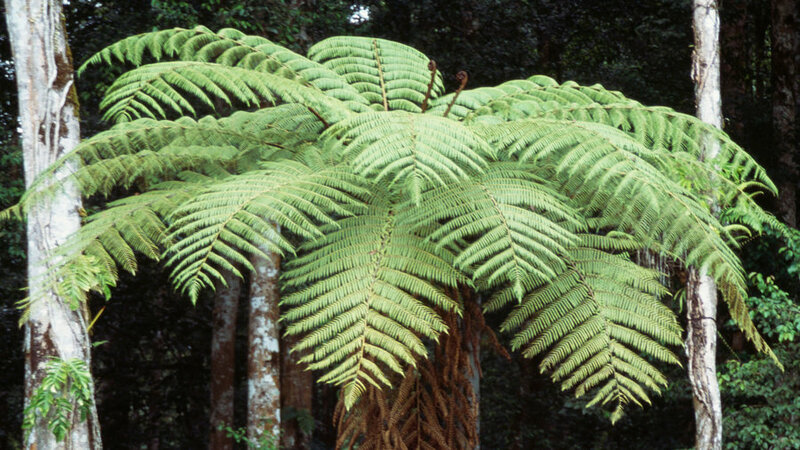 In the wild the numbers of Hawaiian tree ferns are shrinking, and it is best to only purchase plants from nursery-propagated stock. 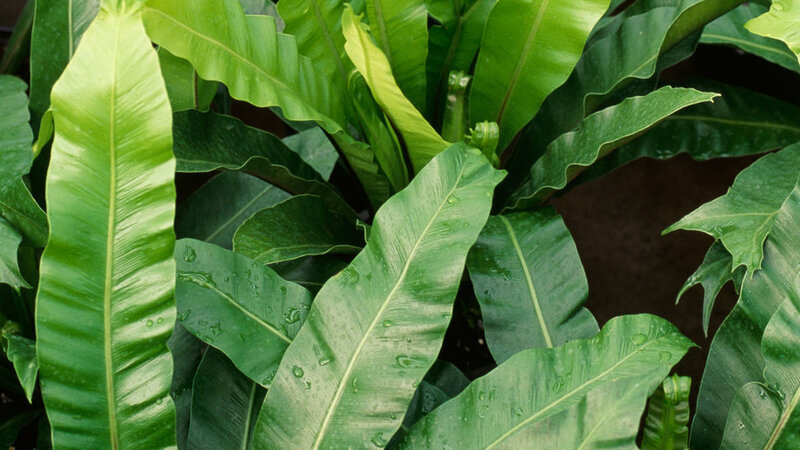 Plants are not cold hardy and thrive in moist, tropical climates. 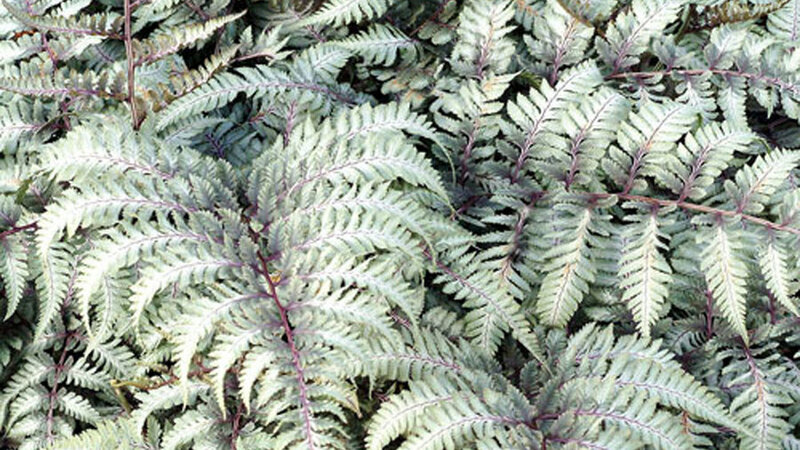 Most varieties of Athryium ferns thrive in damp, shady borders where their delicate fronds form a lush, mounding groundcover. Japanese Painted Ferns (A. niponicum pictum) are prized for their purple base and stem coloration, which deepens when they are planted to receive morning sun. Plant in woodland gardens and pair them with plum-colored heuchera and hellebores. Plant these low-growing ferns as ground covers in beds with moist soils that drain well—slopes and rock gardens work particularly well. While their delicate fronts resemble those of Western sword ferns (Polystichum), licorice ferns are much smaller and spread horizontally to form mats. In costal areas, the ferns can take full sun; plant in part shade inland. 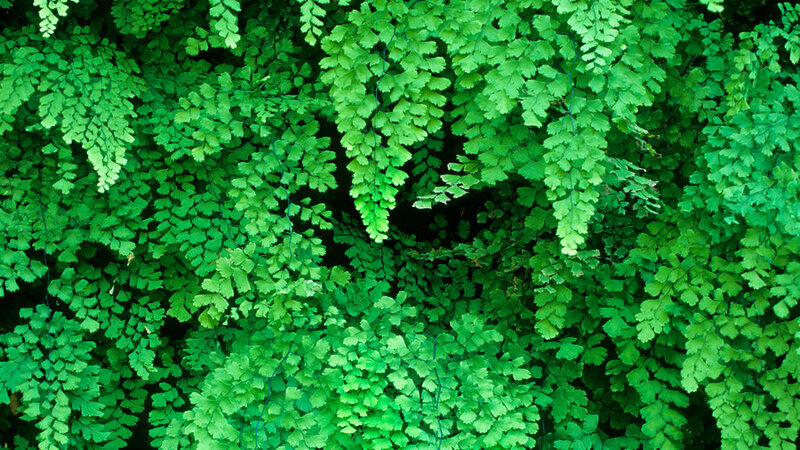 The tiny bright green leaflets of maidenhair ferns spread like fans, forming cascades of foliage on damp slopes and creek beds. Grow tender tropical and subtropical varieties (A. raddianum, A. hispidulum, and A. cuneatum) indoors on windowsills or in sheltered doorways where they receive bright indirect light. Plant North American natives (A. aleuticum and A. pedatum) outdoors as edging for freshwater pools or among mossy boulders. All varieties need to be kept moist and thrive grown in soil rich in organic matter. The fuzzy paw-like rhizomes of this small scale fern give the plant its common name. Delicate bright green fronds grow above the rhizomes to form a mound about one foot tall and 6 inches wide. Grow in hanging baskets in bright indirect light or use as a groundcover in mild winter areas—plants are hardy to 30° F.
The feathery soft fronds of mother fern (A. bulbiferum) have a graceful form that is best appreciated when the ferns are grown in containers or spilling over rocks in shady garden beds. Once mature, the plants can reach 4 feet tall and wide and are hardy to 26° F. The tender new foliage can be susceptible to snails and slugs—handpick the pests and sprinkle bait around crown base. These tropical epiphytic ferns do not need soil to survive and grow in the wild latched onto tree trunks and branches. In garden settings, recreate their natural environment by mounting the ferns on wooden shingles, in hanging baskets, or directly onto garden tree trunks for showy accents. 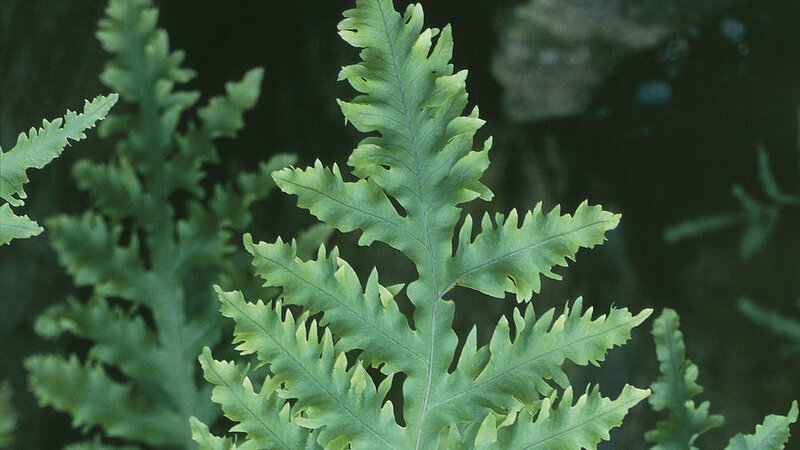 The ferns thrive in filtered light and require thorough watering to keep the spongy frond base moist. Protect from frost. Three characteristics set Tasmanian tree ferns (D. antarctica) apart from look-a-like Australian tree ferns (Cyathea cooperi): they are much slower growing, reach 15 feet rather than 20 feet (C. cooperi) at maturity, and their arching bright green fronds are more finely divided than their Australian counterparts. 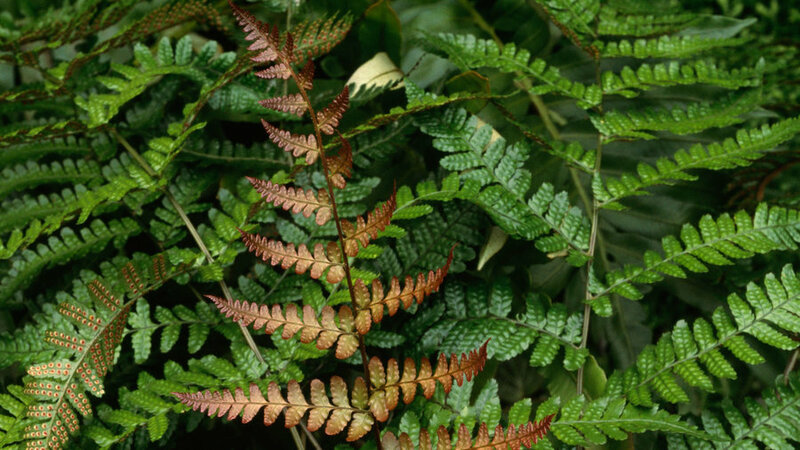 Both ferns are hardy up to 20° F and thrive planted in rich, moist soils with bright filtered light. 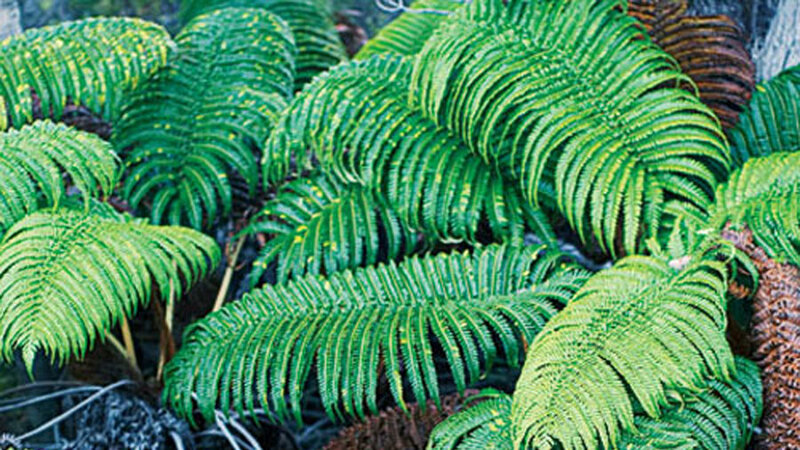 These easy-care natives are the most common wild ferns in Western forests. They grow equally well in richly-amended garden beds. Plants reach 2 to 4 feet tall and wide, and form finely divided deep green fronds held upright like feathery swords. In gardens, plant them in shady beds, along the dark side of walls, or as the under planting for large shade trees. Once mature, Western sword ferns (P. munitum) can tolerate low to moderate irrigation although plants will look more lush with regular water.